I checked Firefox 1.5.0.2 and you get the normal default Google Search Page and the same in Opera 9.0 Beta. Neither had any Spam. Thinking this was in retaliation to some "dirty" Microsoft trick, I checked MSN Search with Firefox and found no Spam to install Internet Explorer or an image to some Internet Explorer Propaganda Site. Google really needs to rethink where it is going here. Getting in bed with the Propaganda that SpreadFirefox pushes is bad for business IMO. I would recommend Google check the facts before they continue down this road. 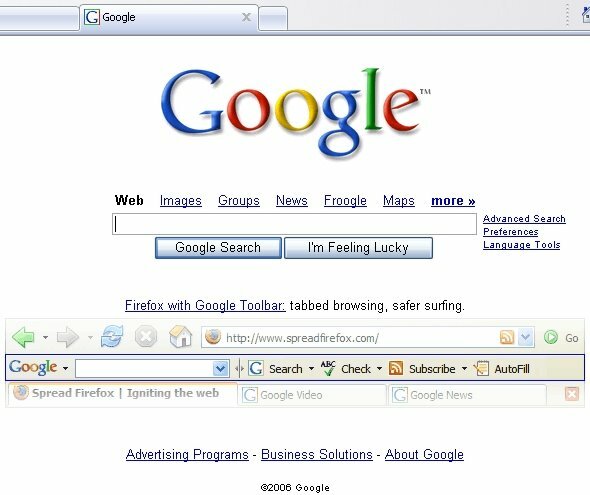 I'm using IE 7 which already has Tabs and you can get Tabs for IE 6 with the MSN Toolbar. That leaves Security... well I don't have any security problems with IE 7 and never had any with IE 6. As for Firefox's Security, it is nothing to get excited over. Regardless IE Users who choose to use Google should not be subjected to this level of Spam and Propaganda. I just want my search page back or does Google really want people switching to MSN Search? Not Surprisingly the Fanboys over at Digg.com wasted no time exploiting this for more publicity straight to the front page. While they make sure to bury any criticism. Business as usual. Are you an IE7 beta tester? Just curious since IE7 hasn't been released yet. Might I suggest you stop using Google if the fact they put a link up to a piece of their software so upsets you? I use Firefox and IE and could care less as long as they both display the page. Since I don't pay anything for the google engine...having a link at the bottom of the search page doesn't seem like a big deal. I'm sure you could just use MSN and not have to deal with it. As much as google is advertising firefox, they are also advertising google toolbar for Firefox; in essense they're advertising their own product (google toolbar) for Firefox. Is it not also true that there are folks on the internet that are completely ignorant about Firefox? For starter tabbed browsing is built-in whereas IE requires a download to get that up and running. IE7 beta is simply a beta so scratch that. Secondly, "safer surfing" is even "advertised," IMO, during a Windows XP (sp2 integrated) install; it's all relative. safe surfing with firefox may not mean much to you as thankfully, you had zero issues with IE, but many people are not as fortunate. The reason you're getting this SPAM has nothing to do with being an IE user, it has to do with being an IE7 user which the Google search page hasn't been coded to recognize IE7. Google isn't supporting IE7 in the Beta phases (and shouldn't be expected to) so you're receiving the same page that any user would find if they hit Google with an "unknown" browser. IE6 users do not get the same page. And if for some reason you are inclined to believe that Google SHOULD support IE7 as it's release is inevitable, be aware that a good portion of Microsoft.com does not support IE7 (most notably their partner site). It's no secret that Google supports and promotes Firefox. Nothing to see here. Move along. No I am not an IE Beta Tester, IE 7 Beta is available for free as a download. I don't want to see advertisements for Firefox on the default search page of Google, let alone one that shows a link to www.spreadfirefox.com. And I don't care if IE7 is in Beta, I think the guys at Google can figure out how to detect it. "I don't want to see advertisements for Firefox on the default search page of Google, let alone one that shows a link to www.spreadfirefox.com. And I don't care if IE7 is in Beta, I think the guys at Google can figure out how to detect it." it is amazing how strongly some people feel about IE. It's pretty simple don't use IE 7.0 or don't use Google and you won't see the ad. By the way, you figure that Google should support IE 7.0, but don't seem to mind that Microsoft's own pages don't. By the way, you want obnoxious spam in a browser...how about Microsoft's lovely little smart tag system? That is the stupidest response yet, don't use IE 7 and Google. I am and will use both and have been before without spam. Microsoft Corporation does not support IE7? Whoah. Link to where you get that impression. It publisizes it! It says it's the top download! Where does it say anywhere on Microsoft.com that it hate IE 7? wow...this is a dumb argument people......the Internet thrives on advertising and Google especially. Get used to it. Otherwise kiss the net goodbye because it's all about marketing out here. As for IE and FireFox; well, trust whom you will and use what you want and deal with the ramifications. Frankly, in my experience, IE6 and the Google Toolbar do the trick and I do not use any desktop search software and I hate tabs. Thus, the default search built into Windows does the trick when I need a file.....have funa nd quit arguing! Yes I am all for advertising. This has nothing to do with making money since Firefox is free. It is an anti-IE ad with a picture to the Spreadfirefox propaganda page. quoting 'ie supporter', "Microsoft Corporation does not support IE7?" 'spent' was on the dot with what he claimed. I downloaded IE 7 less than 24 hours after it went gold, and found that it displayed www.microsoft.com in a less than optimal way.. less optimally than Firefox or IE 6 at least. Current the page displays perfectly in IE 7 except for a little border discrepancy at the top right hand corner, and the lack of Cleartype antialiasing for the links in the lefthand column, in contrast to the text in the main body of the page. 'Andrew', Microsoft released BETA builds of IE with the full intention of getting feedback from users whether they are volunteering it, or not. This may come in the form of error reports or debug data (it's a wild guess with the latter). By definition a BETA tester is one who downloads BETA builds. www.microsoft.com looks fine to me. But WHO CARES? This is about Google Spamming me with SpreadFirefox ads! There is no excuse for it EVER!